These roller conveyors generally have double or triple and sometimes multiple strands of chains running over fabricated frames and guides. They are used where positive transport of goods is required, and are often used in conjunction with roller conveyors where a change in direction is required. Powered conveyors are suited for truck loading distribution centers, packaging, portable assembly lines, shipping and receiving. 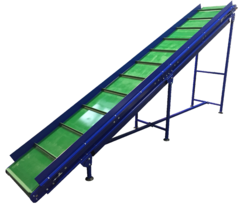 The built-in guard rails in horizontal belt conveyors is ideal for overhead conveying applications. It easily conveys boxes, cartons, cases, bags, etc., as well as loose parts. It is easily adjustable according to the floor type. Adjustable 2-1/8 in. dia. pre-lubricated ball bearings. guards included. The formed steel slider bed is 4 inchs deep with deep guards, powder painted together with splice plates. 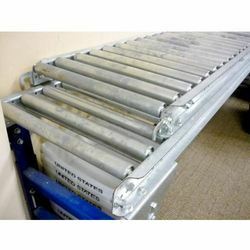 We are offering wide range of Portable Conveyor. These are fabricated by our experienced staff from high grade materials with advanced machinery and equipment.Portable Conveyors are widely used to carry heavy loads in many industries, some of which are - coke manufacturing. These are appreciated for their high efficiency, optimum performance, durability and reliability. Also, the product is reasonably priced. We are offering wide range of Industrial Conveyor for Warehouses. The offered range is designed using excellent quality raw material and sophisticated technology in complete compliance with international quality standards. Offered range is used in handling loads from one place to another. 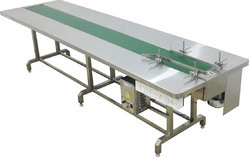 We offer a range of Pharma Conveyor that are fabricated using quality material with wash down facility. The precision engineered conveyors are automatically controlled and are accessible for fast and effective cleaning thus preventing cross contamination. We offer Turn Table that is fabricated using premium quality material and is efficient in working. The turn tables are used extensively to rotate products on the conveyor lines around horizontal axis. We offer packing conveyor that are designed and engineered to fulfill the needs of any packing environment. Renowned for hassle free performance, it is extensively used for bottling and packaging. We offer bottle transfer chain conveyor that is used to transfer bottles of different diameters from one place to another. Widely finding application in bottling and engineering industries, the chain conveyor has railing for bottle support. 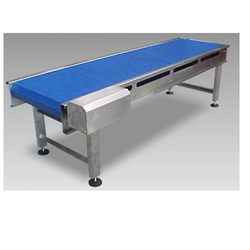 We are engaged in the manufacturing and exporting of quality conveyors that includes liquid eye inspection conveyor. These are robustly constructed using set industrial standards and are offered in various size specifications of 4 feet, 6 feet and 8 feet. Inclined belt conveyors are fitted with cleated conveyor belts ideally suited for food industry, packaging industry. 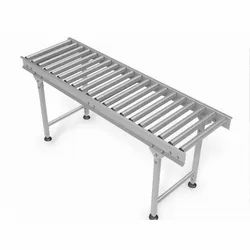 These conveyors are designed with stainless steel sheet metal slide bed and side frame. These roller conveyors generally have double or triple and sometimes multiple strands of chains running over fabricated frames and guides. They are used where positive transport of goods is required, and are often used in conjunction with roller conveyors where a change in direction is required. 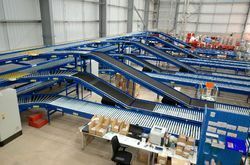 These roller conveyors are often employed for use in systems handling cartons or tote bins, but are also commonly found where movement of heavy loads such as pallets, drums, still ages and collapsible pallet boxes used in warehouses, manufacturing areas and in mail order or sorting houses. In certain situations where a product is irregularly shaped or has protrusions like feet and cannot be safely handled on other conveyor style then chain conveyors will often be used for the transporting job. These roller conveyors generally have double or triple and sometimes multiple strands of chains running over fabricated frames and guides Industrial Conveyor. They are used where positive transport of goods is required, and are often used in conjunction with roller conveyors where a change in direction is required. We offer Packing Conveyor that are designed and engineered to fulfill the needs of any packing environment. Renowned for hassle free performance, it is extensively used for bottling and packaging. Fabricated using stainless steel table top, it contains dimensionally stable belt that is resistant to decay and rot and is flexible despite frequent cleaning. 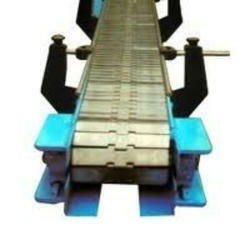 Less stretchable and light weight, the conveyor belt is highly wear resistant and generates very low noise. Customized solutions are also provided as required by the client. 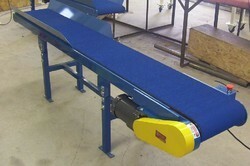 Looking for Industrial Conveyor ?